An infection caused by a femur fracture is one of the leading devastating complications resulting in hip revision surgery. 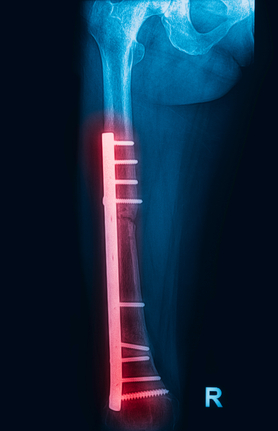 A periprosthetic fracture on the patient’s femur can occur by accident during revision surgery when attempting to remove the implant for replacement. However, the surgeon often has no other alternative but to purposely fracture the patient’s femur during surgery to remove the implant stem. While there are numerous reasons a hip replacement device can fail, deteriorating components represent a high majority of hip revision surgeries. Artificial hip manufacturers, including Stryker, have recalled a variety of orthopedic medical devices including the ABG II and the Rejuvenate modular neck hip systems. This is because most are fabricated with proprietary metal alloys that can corrode, fret and fail over time, causing a variety of problems including infection. Experts have long touted hip arthroplasty (replacement surgery) as an innovative solution for millions of individuals suffering hip pain from arthritis and other medical conditions. However, replacing a hip with Stryker and other manufacturers’ implants has associated complications and risks. Historically, doctors have implanted hip replacement systems in older patients who tend to be less active or suffering from severe cases of arthritis. However, in recent years, Stryker, the New Jersey-based prosthetic device manufacturer, marketed their Rejuvenate hip replacement system to younger more active individuals to improve their flexibility and mobility. Unfortunately, many Stryker hip replacement device failures were reported within months after making it available to the public. By July 2012, the company voluntarily recalled its hip replacement device systems, starting a cavalcade of lawsuits aimed at compensating injured victims for their pain, suffering, damages and loss of quality living. Many of the first reported signs of failure indicated deterioration of the hip replacement metal surfaces. Friction caused by two components rubbing together (the hip ball and cup) caused abrasive wear and produced free-floating debris. Often times, the loose debris irritates and inflames the surrounding tissue while causing infection to the area. Some patients who have undergone an initial Stryker hip replacement surgery have experienced an acute (temporary) infection in the joint area. Unfortunately, many patients with Stryker hip devices experience chronic (permanent) infection that developed in both the early and late stages after the implant surgery. Depending on the infection’s location, it can be superficial and easy to treat, or deep in the leg and nearly impossible to treat using pulsatile lavage or debridement. Often times, the device needs to be replaced to prevent further growth and colonization of the bacteria. If the bacterial infection occurs deep in the leg during the late stages after surgery, it is often unlikely to completely eradicate the infection while attempting to preserve the hip implant. Because of that, physicians often recommend revision surgery, to remove the existing implant and replace it. Infections caused by a Stryker implant device can be either a bacterial or fungal pathogen. Depending on the causative bacterium, the course for treatment is often complicated and prolonged, even after revision surgery. Though rare, a fungal infection is often persistent and complicated. It is usually found in patients suffering from suppressed immune systems. Unfortunately, any local anti-fungal therapy will likely not produce optimal results, and instead, require revision therapy. Often times, the patient is required to have the implant removed and replaced with a temporary “spacer.” This will allow time for the body to heal the infection before a new replacement hip is implanted weeks or months after the first revision surgery. In extreme cases, where no treatment plans can control the infection, the leg and entire hip might need to be amputated. The cost involved in managing an infection through proven treatments with follow-up hip implant revision surgery is expensive. Because of that, many victims that were implanted with a Stryker hip replacement system are taking legal action for financial compensation to recoup their damages, losses, pain, and suffering. Victims suffering infections from their hip replacement implant are holding Stryker accountable for their actions of designing, manufacturing and distributing defective hip replacement systems that have failed. Thousands of lawsuits over the Stryker ABG II and Rejuvenate hip implants have already been filed, with action pending in appropriate federal courts across the nation.